Located on the rugged west coast of Cape Breton Island, with tumbling sandy hills, and sweeping ocean views, Cabot Links is among the one percent of courses that may truly claim links status. Inaugurated only six years ago, it has already made a name for itself as a global golf destination. A links is the oldest style of golf course. The name means “rising ground” or “ridge” and refers to areas of coastal sand dunes between land and sea. A links course is sculpted to the landscape to balance topography, views, vegetation, and wind, with the game itself. The design of such a course demands a sensitivity to the terrain. 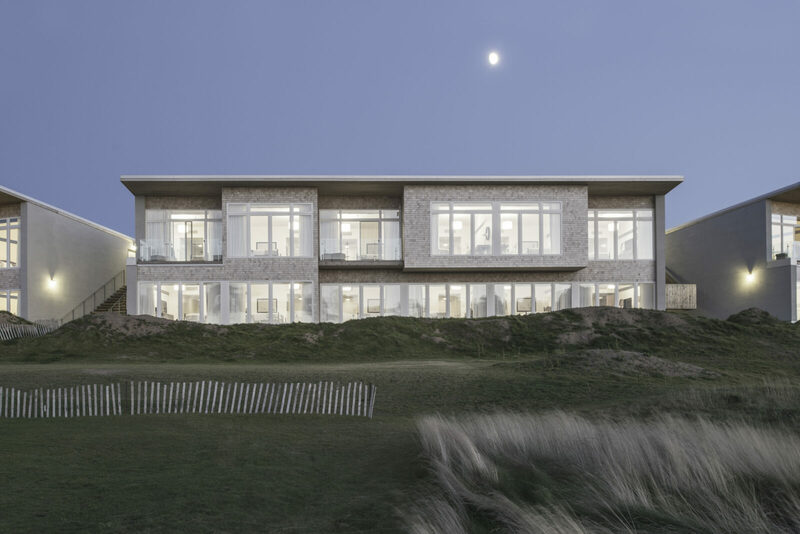 The Lodge at Cabot Links echoes this sentiment with its curved form following the contours of the land to express a vision of the complementary relationship between landscape, building and human play. Sited between the town of Inverness and the Atlantic Ocean overlooking the Gulf of St. Lawrence, the lodge presents two contrasting faces. Fronting the town is a 350-foot curved, heavy timber wall, clad in cedar shingle. The wall snakes though the site, connecting the lodges and leads arriving guests toward the course. The wall is a screen between the suite entrances and the parking area behind. It also supports an elevated walkway serving suites on the upper level. Facing the ocean, the lodge presents a more open, lively elevation. Four two-storey volumes, each containing twelve suites, alternate with open stairways that add rhythm to the composition. A fifth volume, the reception and administration building, anchors the north end of the lodge. These volumes are clad in cedar shingles and punctuated by abundant glazing. The Cabot Links Lodge grows out of both its landscape and cultural conditions. Wood construction is very much part of the vernacular of rural Cape Breton and allows the project to be embedded within the community. Dividing the building into separate lodges and linking them with the curved shingle wall, creates a powerful form in the links landscape while allowing the project to be constructed to the requirements of a more permissive part of the building code, while featuring the warmth and beauty of wood construction and cladding.